Click here to purchase more than one Stay Healthy Book and save $10. 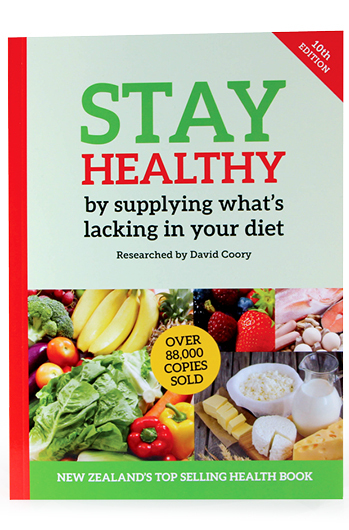 Updated in 2016, this edition of New Zealand's most popular and easy to understand health book (over 88,000 copies sold) is packed full of priceless health information and now with international measurements. This book shows you how to dramatically improve your health by making small but critical changes to your diet. When you supply your body with the correct balance of minerals, vitamins and fats, you will enjoy a clearer mind, sharper memory, sound heart, efficient immune system, clear arteries, healthy bones, loads of energy, a worry free outlook on life and refreshing sleep. You can say goodbye to, or avoid altogether, many embarrassing and misery causing health problems. These are healed by optimum nutrition - just small but important changes to your diet. Your body is able to heal them naturally from within, or prevent them ever occurring. Often all you require are the important minerals like boron, magnesium, zinc, selenium and iodine which are lacking in soils or lost in the processing of our food. Farmers know the dramatic difference diet minerals make to the health of animals and the same principals apply to us. There are sections in the book showing you how to prevent Alzheimers, Cancer, Heart attack, Stroke, Macular Degeneration and Autism. Also a fail proof way of losing 3kgs a week and then remaining permanently slim for the rest of your life. The book is easy to read, has large print, cartoons and very informative health hints. There are over 40 sections covering nutrients including all common minerals and vitamins. There is information on each one, the role it plays in your body, the effects of having too much or not enough, the recommended intake levels and a table of food sources rich in that nutrient. I find your book the best Health Book I have ever purchased. It's the first time anything I have been interested in and purchased has exceeded the advertised expectations. The book is absolutely wonderful, it will take its place amongst the array of medical texts in my bookcase.